Make delicious Cheesy Chicken Enchiladas at dinnertime today! In under an hour, you can serve Cheesy Chicken Enchiladas for the whole family to enjoy. Heat oven to 350°F. Combine chicken and soup; spoon down centers of tortillas. Roll up. Place, seam-sides down, in 13x9-inch baking dish. Top with tomatoes and cheese. Cover with foil. Bake 30 to 35 min. or until cheese is melted and enchiladas are heated through, removing foil after 20 min. 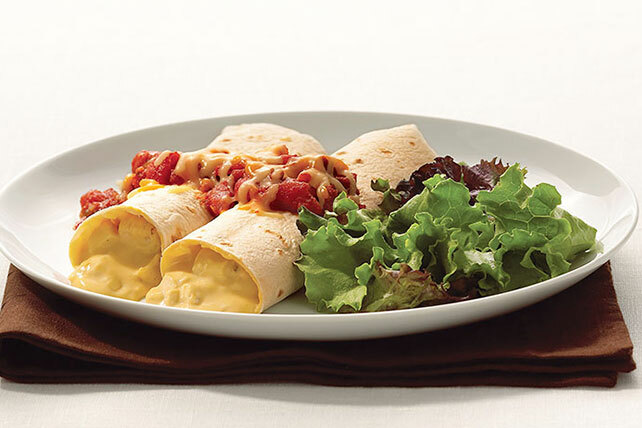 Save 50 calories and 7 grams of fat per serving by preparing with KRAFT 2% Milk Shredded Reduced Fat Four Cheese Mexican Style Cheese.